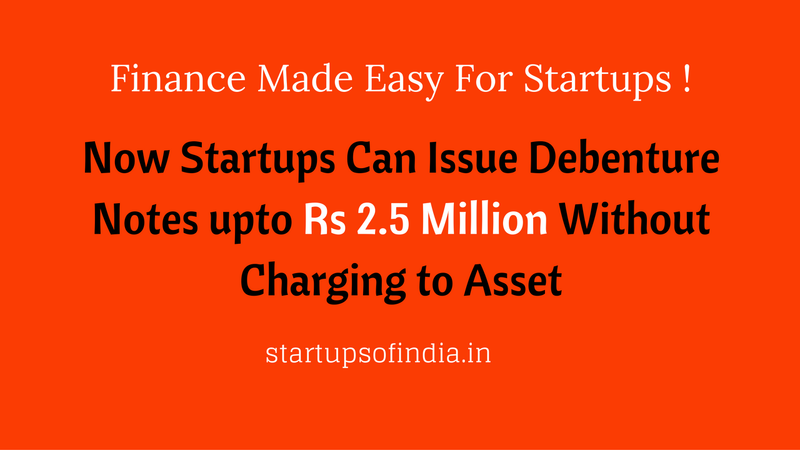 Startups Can Accept Deposits upto 2.5 Million as Convertible Note Without Charging to Assets ! What Positive Change for Startups ? that does not any statutory requirement of creating a charge. That will make life easier for startups as in the beginning they might not have that much assets to secure the debentures. As per sub clause (xvii) of the Rule 2 (1) (c) of the Companies (Acceptance of Deposits ) provides that a startup can receive an amount of Rs. 25 lacs or more by way of convertible note (convertible into equity shares or repayable within a period not exceeding 5 years from date of issue) in a single tranche, from a person. Please note that the amended Rule defines ‘Start-up Company’ to mean a private company incorporated under the Companies Act, 2013 or the Companies Act, 1956, and also fulfilling Start-up India Guidelines issued by the DIPP. Further the new word ‘Convertible note’ used in the amended Rule has also been defined to mean an instrument evidencing receipt of money initially as a debt, which is repayable at the option of the holder, or which is convertible into such number of equity shares of the start-up company upon occurrence of specified events, and as per other terms and conditions agreed to and indicated in the instrument.